A fun way to spend the day with your kids can include going out for a nature walk. Going outside to enjoy the fresh air while away from distractions like electronics, television, etc. is a great way to enjoy some time with your kids. It gives you a chance to talk, catch up on the latest news, and just enjoy some time to act silly together. 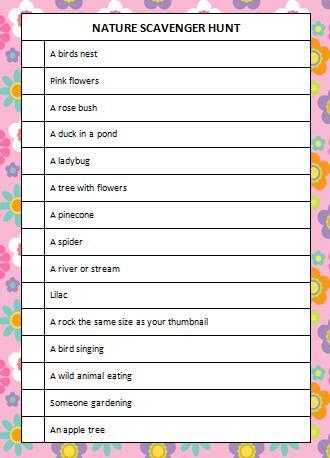 Bring along this free printable nature scavenger hunt and see how many items you can find along your walk. Simply print the free printable nature scavenger hunt and have your kids search for items during your walk. They can just point them out to you as they find them. You may want to camera along too because you never know what types of fun discoveries you’ll find when out for a walk in nature. Since every walk in nature is different, you can use this game over and over again! Looking for other fun & free printable games? Check out our free printable games page for a listing of all our other games. There are plenty of scavenger hunt ideas, charades, word searches, trivia, word scrambles and more. If you could see any wild animal out in nature, which type would it be? What would your child say is the coolest thing he/she has ever seen in nature? We’re always adding new ideas for family fun and free printable games. Stay updated on the latest ideas for family fun by following us on Facebook, Twitter, Pinterest or our new RSS feed Bloglovin’. I love this idea!! Maybe we’ll give it a try today since the sun is out! !